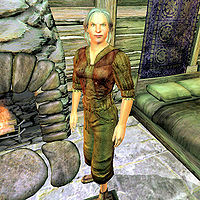 Jantus Brolus is an Imperial spellsword and basic trainer in Illusion, living in Bruma with her husband Istirus. Despite her adventurous youth, she lives a very simple life in the cold city of Bruma, starting every day at 6am by wandering around her house for six hours. At 12pm she will head outside and stroll around town for two hours, preferably in the area in front of the Great Chapel of Talos, where she will chat with her husband and the other townsfolk. At 2pm she will enter Novaroma for some browsing until she decides to go back home at 5pm, where she will stroll around for a few hours until her dinnertime at 9pm. Once she has finished her meal at 11pm she will roam around the house for a single hour, until she finally goes to bed at 12am. On Loredas and Sundas, she will skip her trip to Novaroma, and instead return to her house at 2pm, patiently waiting for her dinnertime. Her services will be available at any time of the day, except when she's scheduled to eat, sleep or to take her daily stroll around Bruma. The only exception to this schedule is during the Defense of Bruma, when she will cheer on Martin Septim as he makes his way out of the city gates to the battlefield. Jantus wears a full set of common lower-class clothing, a patched vest with a pair of sack cloth pants and oiled linen shoes. She also carries the key to their house and a small amount of gold. She knows a leveled set of spellsword spells as well as a few extra from Illusion. She seems to be a woman of few words, as you will notice when you speak with her for the first time:"I'm Jantus Brolus. I'm the Illusion Trainer." If you ask her about the city of Bruma, she will accept to be more talkative:"Istirus and I used to be adventurers, but we've retired here. Bruma is far from civilization, but we're ready for a little peace and quiet." The townsfolk of Bruma have also noticed Jantus' magic skills, as they will occasionally comment: "I've heard that Jantus Brolus is skilled with both magic and steel." and "Jantus Brolus is apparently an excellent mage." Furthermore, you can often hear conversations about her: "Have you ever spoken to Jantus Brolus? ", "Do you know Jantus Brolus, the spellsword? ", "I wouldn't call him [sic] a friend. Still, if I wanted to learn more about illusions, he's [sic] the one I'd ask." and "Can't say I know him [sic] well. I understand he'll [sic] train people to cast illusions, for a price." Fellow citizens often refer to her as male, despite the fact that she is clearly female.